Bristol Trades Union Council (BTUC) are holding two events which they are encouraging people to support if you can. On Saturday 28th April, International Workers Memorial Day will be observed with a march from the Unite offices at Tony Benn House in Victoria Street to the Memorial Plaque in Castle park where wreath laying and speeches will take place. Assemble at Tony Benn House at 12 noon. The annual Workers Solidarity Day March and Rally will be held, as usual, on Tuesday 1st May. Assemble by the church in Castle Park at 12 noon. 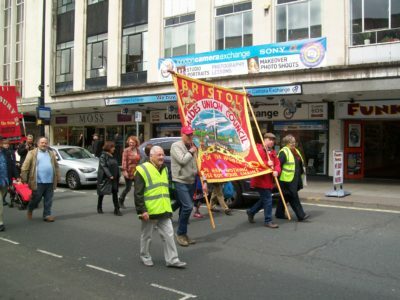 The march will commence at 12.30 led by the Musicians’ Union Band and will proceed around Broadmead back to Castle Park to the Rally which will be addressed by Brendan Kelly, RMT Regional Organiser, James Davies PCS Organiser and International and Labour Party speakers (full line up to be confirmed).